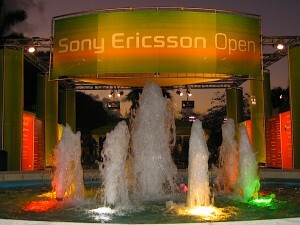 The Sony Ericsson Open, Florida’s most prestigious tennis tournament and the world’s “fifth major”, turns 25 this year. 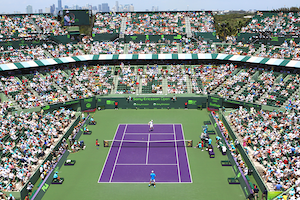 From March 25th thru April 5th , an A-list of competitors will descend upon the Tennis Center at Crandon Park to mark this milestone birthday. From the ATP, Rafael Nadal, the reigning Australian Open champion, world number one and 2008 Sony Ericsson finalist, will honor South Florida with his presence. The supporting cast will include Roger Federer, world number two and dual Sony titleholder, and Serb Novak Djokovic, the 2007 Sony champion. Brit Andy Murray and American Andy Roddick who have had spectacular seasons to date will be counted on for the festivities. Russian Nikolay Davydenko, the defending champion, has been out of commission for weeks due to injury. Hopefully, Davydenko will recover in time to take a stab at a second consecutive title. One of the hottest players on the WTA tour is the current Australian Open and 2008 Sony titlist, Serena Williams. Serena, the female number one, will attempt to win for the third time in a row and is also going for a record setting sixth Sony trophy. Serena will face fierce competition from Russian Dinara Safina, the world number two and this year’s Australian Open finalist, Jelena Jankovic, the Sony 2008 finalist and world number three, not to mention her own sister Venus Williams, who has three Sony Ericsson Open trophies to her credit. Maria Sharapova, whose shoulder has been on the mend, may also make an appearance, giving the field a run of its money. On the doubles side, Mike and Bob Bryan have regained the top doubles ranking since winning the Australian Open and will be ready to defend their Sony title. The Bryan Brothers will be a prime target for teams such as Mark Knowles and Mahesh Bhupathi, who took second place last year, Max Mirnyi and Andy Ram as well as Brazilians Andre Sa and Marcelo Melo.